In order to powder coat, you will need some type of oven in order to cure the powder coating. You will need an oven that is capable of sustaining 450 degrees and it will have to be large enough to fit your powder coated objects inside of. There are several different options available to a beginning powder coater and they will be discussed in this post. The cheapest powder coating ovens that you can use to start with if you don't want to spend too much money are: a toaster oven, a household oven, or a propane grill. You can also get lucky and find a cheap commercial oven. If you have a larger budget, you can build or buy a large dedicated powder coating oven. Powders coating ovens are one of those things where the price goes up gradually with the size until you pass household oven and then the price jumps into the thousands of dollars range. An oven you could fit 4 wheels or a bike frame would cost you $2000 or more. If you want to an oven that will fit a car, you're looking at $10,000 to $20,000. The absolute cheapest way to a large powder coating oven is to build one yourself. 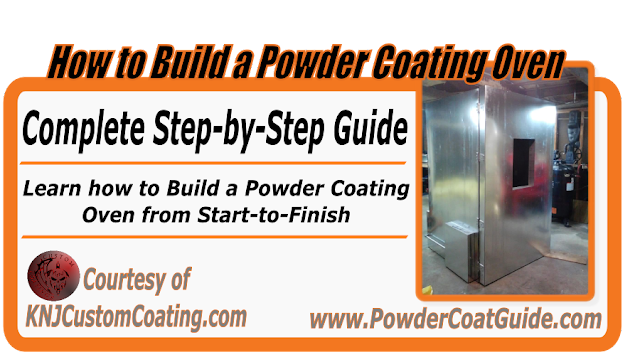 If you would like to see complete step-by-step instructions to build your own powder coating oven like the one below, check out our article "How to Build a Powder Coating Oven" and How to Build a Powder Coating Oven: Part 2. If you want to start powder coating this week, a toaster oven is the perfect type of oven to start out with, also good if you know you are only going to be powder coating small items. They are cheap, readily available, heat up faster than a household oven and use less electricity. They take up less space and they can operate off of a normal 110 volt outlet so you can plug it in anywhere. If you want the absolute largest toaster oven out there, check out the Oster TSSTTVDGXL-SHP Extra Large Digital Toaster Oven . This is the toaster oven that I was planning on buying but instead, decided to just go straight to a household oven. If you want to use a toaster oven though, the Oster is the one to get. It is ~16" wide x 13" deep and it bows out in the back to make it a little bigger. Highly recommended as far as powder coating toaster ovens go. Household ovens are the go-to oven of the beginning powder coater. They are cheap, abundant, and big enough to powder coat individual wheels or a handful of smaller parts at once. 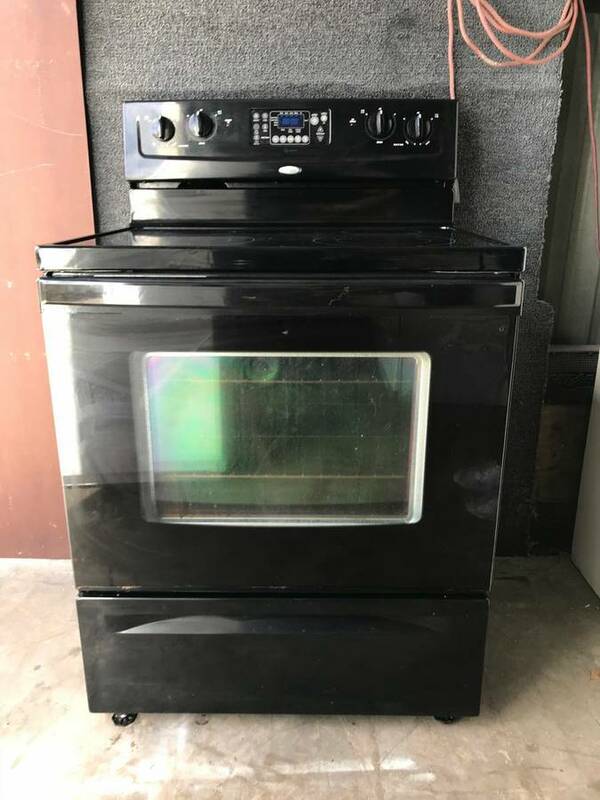 If you have $100, you have the option of basically any used oven on Craigslist in the appliances section. You don't really need any fancy features except a timer and the oven has to be able to keep a stable temperature throughout the powder coat curing cycle. You can also get a double oven if you want to coat larger quantities of parts at the same time. Assuming you are using a used household oven, all of the old food grease needs to be thoroughly cleaned out or it will cause issues with your coatings. Whatever oven you use for powder coating oven should never again use to cook food. 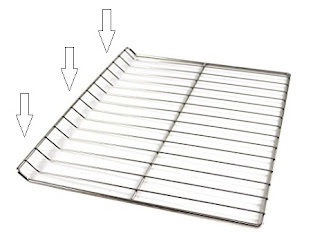 The standard oven racks are very useful for hanging parts from but the issue is that they have to be put an angle to slide them into or out of the oven. You can easily modify the oven rack so that you can slide it in straight and level. Place your oven rack on a solid surface and smash the back angled edge down with a decent sized hammer until it is flat. Just focus on the thicker outer edge and the rest of the smaller bars will follow. The downside to a household oven is that they need their own 240v outlet/circuit. Unless you have one in your garage already, you will need to have one installed or install it yourself. There are guides all over the internet, like this one teaching you how to install it and it is pretty straightforward. You really only need a few parts such as a breaker specific to your breaker box, some 10/3 wire, and 240v receptacle. However, it is a job that can KILL YOU. Electricity is no joke and something to respect. An improper install can also lead to a fire. Keep that in mind when you are choosing between doing it yourself or calling an electrician. I did do it myself, never having experience with home electricity, and I'm still alive and my house is still standing, but I was extremely careful and spent an entire day making sure it was right, after spending an entire day researching it. You can also use a gas oven, just keep in mind that a cloud of powder has the potential to be flammable, so powder coating in an enclosed room with no ventilation, right next to your gas oven is a practice that should be avoided. 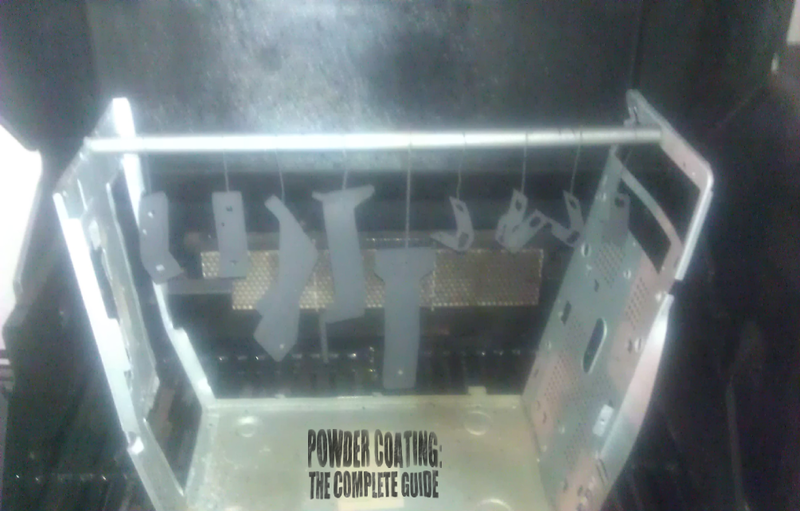 Shield your powder coated part from any open flame and never spray the part while it is in the oven. For those needing a bigger oven, you can make what is called a "pregnant oven" . This is when you make an add-on extension to add on to your existing oven. Usually the oven door is left open and a box with an open side rests on it and seals against the oven opening to make a larger oven. Here is an example of a temporary Pregnant Oven setup made using cheap insulated panels and foil tape. materials. NOTE: This is a "do at your own risk" type of thing. Please use caution when modifying any oven. You can modify an existing oven such as a double oven. If you cut the center out of a double oven, you will have a pretty good size oven. They are also not too expensive on Craigslist. This is a less conventional method. In fact, when I searched for others doing it, I found none. I tried using the propane grill for one reason. I was brand new to powder coating, was researching toaster ovens but hadn't bought one yet, my powder coat gun arrived in the mail, and I had to try it out right then. I didn't have an extra house oven, but I had a grill I never used in my backyard. It worked great, I put a cookie sheet down on the grate to shield the part from the flames, and made a rack using a gutted computer tower to fit inside the grill. All of my parts came out with no issues. However, with a grill, you have to babysit it the whole time to keep the temperature correct. I stood there with my infrared thermometer for the complete cure time, anytime the temp would move, I had 3 knobs to turn to get it back to the right temp. I became very good at this eventually. I eventually upgraded to a household oven but the grill served its purpose. If I couldn't install a 240V outlet in my garage, I would still be using the grill. The same warnings apply as the gas oven, you are dealing with an open flame and flammable powder. Powder coated parts cured in a grill. This is an oven that was sold at harbor freight specifically for powder coating. The nice thing about it is that it is a lot bigger than any toaster oven, yet it plugs into a normal outlet. The inside dimensions of this oven are 18"x18"x18". In comparison, a household oven averages around 23" wide x 19" deep x 15" tall. 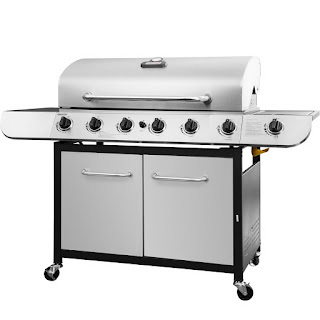 This oven from harbor freight is considered to be very good quality and also has 5 star reviews. This oven was discontinued at Harbor Freight, but you can still find them used if you search hard enough. Another way to cure your powder coated items is using a infrared curing lamp. This would be another solution to coating a large part without having a large oven. The down side is you must build some kind of enclosure around the part to keep the temperature high enough. The part will will not reach the desired temperature or heat evenly in open air. 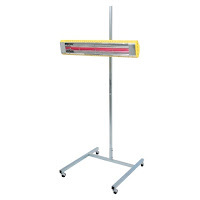 Also these infrared lamps can be expensive and they can only cure 1 side of a part at at time. If you were powder coating a cube, you would have to reposition the lamp 6 times to cure all sides. Thank you for pointing that out. The article has been updated. What are your thoughts on an oil fired oven with an open flame? Also is the powder only flammable whilst airborne? I have a steel box 12' long 6 ' tall and 6' wide. I am building a oven inside this steel box. 3' wide x 5'8" tall x 8 ' long. I am going to use propane in the steel box to bring it up to 300 deg then use Ele to hold the temp in the smaller box that I build inside to 350 deg. I get propane cheap and it will heat up faster. I am only insulating The inside walls of the Big box. and the door of the smaller box. My brother and I build a similar oven. Ours was made from an electrical outdoor cabinet that was 5' wide by 4' tall and 2' deep. We insulated this box with fire resistant 3/4" insulation board and covered with sheet metal used for duct work. The heat elements were from a propane grill that was 5' wide I no longer used. It gave me 4 burners and the unit heats very quickly. I can get it to 450 degrees in about 10 minutes and turn off the burners and it holds the heat for 15 minutes. We built a frame out of angle iron and put fiber wheels on it to easily move around. I have read your article post. Thank's for tips sharing. Informative and interesting which we share with you so i think so it is very useful and knowledgeable. I would like to thank you for the efforts. I am tiring the same best work from me in the future as well. I have gas fired powder curing oven. its running since last five years, initially it has taken one and half hour and now it's taking to much time as 3 to 4 hour for curing. I've already changed temperature sensor and cleaned the burner. but still problem is there. please let me know how I can resolve the problem. Is it possible that the door seal is damaged or not sealing correctly any more? As long as oven is sealed just as well as it was when you first started using it, I would think the heat source is degrading. So can you use Gas ovens for Powder coating? in researching this I read yes and no, even claims that the powder of the paint is explosive. I just want a yes or no, a gas oven is a little easier for me to setup in my shop since I have a natural gas patch for a grill just on the outer wall. And then there is always propane too. Yes, gas ovens can be used for powder coating. The biggest powder coating ovens out there all use gas. The idea that you cannot use it is just one of those rumors that people like to spread about powder coating. However, you still need to be safe when using a gas powder coating oven. Never spray powder inside the oven and avoid spraying it around the oven if it is on. Powder, like any fine dust in the right concentration, has the capacity to explode if it comes into contact with a spark while it is in the air. Spraying your parts in a spray booth and then placing them in the oven leaves virtually zero chance of an accident. The powder on the parts is not floating around and the spray booth has contained and hopefully caught all the powder on filters. There is basically no chance of an explosion happening unless your entire garage/shop has enough powder floating around that it is actually limiting your visibility. That or you are spraying powder directly into the oven. As long as that doesn't happen, you will be fine. Just for the sake of the very rare freak accident happening and to protect myself from any possible liability, I have to tell you to do this at your own risk type but if you do some quick research, you will see that many many many shops use gas fired powder coating ovens. Hope that helps! I have someone who will give me a used Harbor Freight Powder Coat oven that was used many years ago to powdercoat but no more. Still works. I don't powdercoat but make dog treats for a non profit. Can you clean an oven somehow and then use to make dog or human food safely? It would just help dehydrate the treats without taking up our normal oven space. So just wondering if it's worth it to clean and if safe to use? Sorry but once an oven has been used for curing powder coating, it is no longer safe for food. I would never feel safe feeding my dogs or any dogs treats that have been baked in a powder coating oven. I'm sure that is not the answer you were looking for. What I would do in your situation is sell the oven on craigslist or similar site and use that to buy several toaster ovens. 4 toaster ovens = about 1 harbor freight powder coating oven and they can be had for very cheap or sometimes free. The harbor freight powder coating oven is very sought after among hobbyist powder coaters so it would likely sell very quickly and for a decent amount. It is discontinued so you will likely be the only person selling one in your area. Is there a specific oven size to look for if I'm mainly wanting to do wheels or does that usually necessitate making a pregnant oven? Looking to do up to 20" wheels. I'm trying to find an oven large enough for the 30oz Yeti cups but smaller enough to sit on a table top, what oven would you recommend? If you can find the old harbor freight powder coating oven somewhere, those would be plenty big enough to do multiple yeti cups with room to spare. However they are discontinued so you would need to search ebay and craigslist. Otherwise, you can use a toaster oven. The Oster TSSTTVXLDG is the largest toaster oven out there that I could find. It is roughly 13" tall and according to my searches, the yeti cups are 8" tall so you would have a little wiggle room. The extra large Oster is too small. I tried putting a 30 oz Ozark tumbler in it, today, at the store. I even put the bottom rack ONTOP of the bottom burner and the cup still hit the top burner. If you can figure out a rig to hold it in there sideways, it would work. Just turn the oven on its side. if you're using the household oven what do you have powering the oven and what wattage does it need to be. I have a GE household oven i'm going to use but my generator is only 900 watts...Will that work?? I have a household oven plugged into a 240V outlet that I wired off the main panel in the garage. This is the only reliable way I know to run an electric household oven. I don't think a 900watt generator would be close to enough. The average household oven needs around 3000 watts. 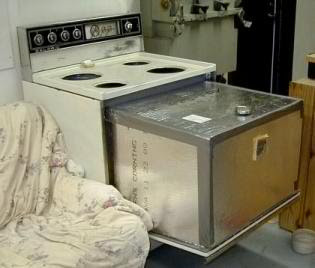 If you are trying to run an oven off of a generator, you may be able to source an oven for an RV. The best way to evenly distribute the heat in the oven is with a circulation fan. Take a look at my articles "How to build a powder coating oven" and you will see how an electric blower motor was used to circulate the air throughout the oven. This could be adapted to your oven. This is perfect for me. I am just looking for the best coating oven. Thank you so much! Thanks for your great article. Right now I'm using a household convection oven to cure small pieces but I am about to move to another house and the garage doesn't have 220 power. Are there similar size ovens out there that use regular 110? You can use an electric smoker to powder coat parts. They are a little smaller than a household oven but still larger than most of the alternatives for the price. They do require some slight modifications to get them up to 400+ Degrees F, mainly just add some insulation and some sheet metal to the bottom portion so that it retains heat better. There are a couple of YouTube videos showing the modifications, just search "powder coating oven electric smoker". 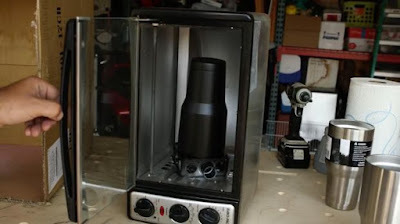 If you are looking for a different alternative, occasionally the old 110V Harbor Freight Powder Coating ovens pop up on ebay. They are discontinued in stores so you'll have to find a used one. I have just bought a small convection oven with a rotating table inside. Can I use this for powder coating? As long as you are not talking about a microwave, I don't see why it wouldn't work.